Step 1: Select your base. I think a crunchy wedge of iceberg or crisp romaine hearts work best. Step 2: Decide on a dressing. Will it be a smear of blue cheese dressing? A creamy caesar or italian? 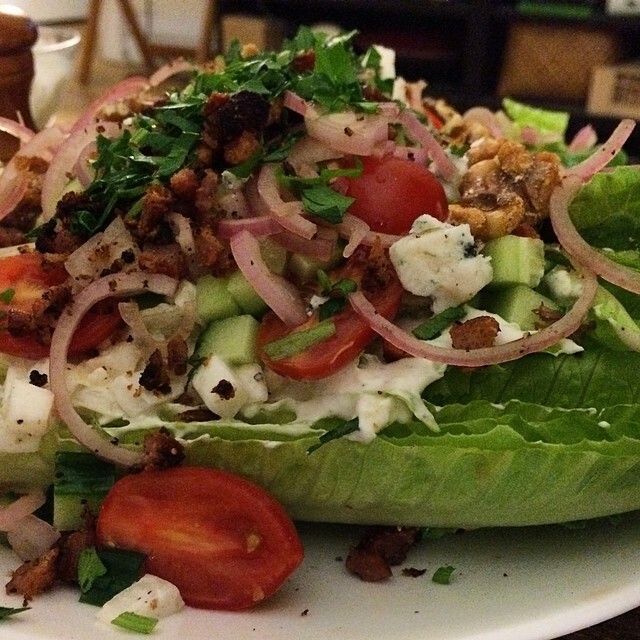 Or do you prefer a meaty bacon vinaigrette drizzled over crumbly blue cheese? Step 3: Choose your toppings. Blue cheese always seems to get lost in the dressing, so crumble some fresh cheese on top. Cherry tomatoes are classic, and add sweetness and acidity. Toasted walnuts and crisp warm bacon are also pretty standard, lending a meaty, salty crunch to the salad. You can leave it at that or add a couple extra touches. Try peppery radishes, crisp cool dice cucumber, some lightly pickled shallots, or even some chopped hard boiled egg. I happened to have some bitter belgian endive in my fridge this evening, so we diced that up and tossed it in some dressing to make a slaw and topped the salad with that before adding the other vegetables. Too much going on? Dial back the ingredients or switch them up. Experiment and have fun with it! Step 4: Finish with fresh aromatic herbs. Finely chopped chives, with their mild onion flavor always pair well with creamy blue cheese and sweet cherry tomatoes. Why not add some chopped dill? Flat leaf parsley and celery leaves also work well. Use their leaves whole to get a bigger punch or flavor. Tags: Cooking, Game Day, Game Day Tomatoes, Ideas, Low Carb, Quick, Salads & Sides, Wedge Salad. Bookmark the permalink.